I have always been a fan of creating art as a form of therapy. I remember when I decided to paint after I had my heart surgery. I had never attempted it before, but I wasn’t worried about creating a masterpiece. Well, I take that back. At first, I was. I thought what if people look at this and scoff? Then I realized this type of painting is for me. I am creating this to overcome something I have been going through. It’s something personal in my life and I can choose to share it with others or not. So I began to paint. Art therapy utilizes the creative process to help people improve their mental and emotional health. Art of any form can be used, such as painting, drawing, coloring, pottery, and many others. Art is a form of expression and exploration. Art therapy helps you with self-exploration while coping with struggles you may have gone through or are going through. It can help you express things you are going through that you may have no comprehended before. Or help you finally express something that you have kept bottled away deep down. Sometimes just the act of making art is therapy enough. You don’t need to figure out what exactly your final product means. For example, the therapy could be as simple as the motion of a paintbrush as you make your art, is therapeutic—the rhythm to the art. An art therapist can be there to help you process these feelings and emotions that you display through art. They can ask you questions about what you made and help you to begin to talk about what struggles you are going through. However, you don’t need a therapist to benefit from art therapy. Maybe you already know what you are feeling, but you need an alternative way to express it. Maybe explaining your feelings through words just isn’t what works. As for the effectiveness of art therapy, there have been many studies done to confirm that art therapy does help with mental, emotional and physical health. The one I found focuses on using art therapy as a physical and emotional symptom relief for cancer patients. The study includes 50 subjects, most of whom have Leukemia or Lymphoma. The majority of the patients had been diagnosed 2-3 years prior. 90% of the patients said that the art therapy session helped to distract them from their symptoms and 92% said that would love to do art therapy again. There was a significant reduction in eight out of nine of their symptoms. These include pain, tiredness, depression, anxiety, drowsiness, appetite, well-being and breathlessness. The only symptom that did not experience a reduction was nausea. 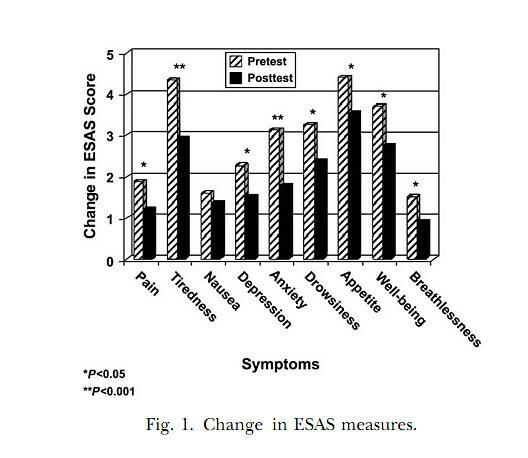 The Edmonton Symptom Assessment Scale (ESAS) is used as the measurement. It measures in what capacity the patient feels pain, tiredness, etc. based on a 0-10 scale. 0 being nothing at all and 10 being the worst. It’s encouraging that art therapy could help soothe those that are experiencing pain from cancer. According to the graph, the patients themselves mentally and physically feel better after engaging in that therapy. If makes me think that if it can help them, it can help anyone get through whatever they are struggling with in life. From my personal experience, art therapy really helped. It doesn’t mean it will help everyone, but it’s always an alternative. Sometimes we are exhausted from talking about our struggles or we have them hidden inside. Art therapy can help with both of those situations. It helped me with both. I had become weary from talking with people who just couldn’t relate. It’s because not many other 17-year-olds had the heart condition that I did. In fact, most who had this condition are around the age of 60. Also, I was hiding how I truly felt deep down. I appeared to be happy, strong, and glad to be alive. Believe me I was, but I was also filled with a great sadness. I kept dwelling on that fact that for the rest of my life, I’d require a new surgery every 10 years. So, one day I bought a piece of canvas, paints, and a brush. I walked down to my Father’s workshop, turned on some music and began to paint. Being able to express myself through art was honestly very therapeutic. It’s what got me to move on from feeling sad to accepting and embracing the heart I had. There is a benefit this Thursday, September 15 on the rooftop garden of The Lacks Cancer Center at Saint Mary’s. Tickets are $75 and that price will benefit art and music therapy offered to patients at Saint Mary’s Health Care and The Lacks Center. This includes hands-on visits from certified therapists directly to the patients. They will be able to use all sorts of art therapy, such as drawing, painting, clay modeling and coloring. "An art therapist told this to their patient, â€œTell the critic in mind to be quiet and just let yourself enjoy doing this. You canâ€™t do this wrong.â€"
I was talking to my friend about this the other day actually. We were discussing what made a person a great artist, writer, musician, actor, dancer... I said that I felt like you can have all the talent in the world, but without confidence, a lack of inhibition, you can never really be great. People may not be able to place a finger on what's missing, but they sense the uncertainty of the artist, that they are holding back. Another idea that comes to mind reading this is a quote I read - I forget how it goes exactly, but it's something about how we are all born artists, but the trick is to stay that way. If only all adults could hold onto to the uninhibited, child's spirit they once possessed, we'd have a lot more artists in the world. I feel like one of the biggest benefits of art therapy, is it's ability to help people tap into the happy, confident, curious, child-like part of themselves again. @Erin I love this "but it's something about how we are all born artists, but the trick is to stay that way." It's so true. Sometimes when I write I get caught up in making sure every word sounds right and constantly edit during my free-writing. This is bad in two ways. 1. it inhibits the creativity that can happen during a first draft 2. I may not catch every little error the first time through. New Prostate Check Guidelines: Should You Get Checked?